I first got into brunch when I lived in Berlin. I must admit that before then, I just did not understand the concept. At the time, American-style brunch was starting to catch on in Rome, and it normally consisted of soggy pancakes drowned in cheap, pale maple syrup, eggs that had been scrambled into a rubbery mess, overpriced dry bagels with cream cheese that cost as much as a lunch. 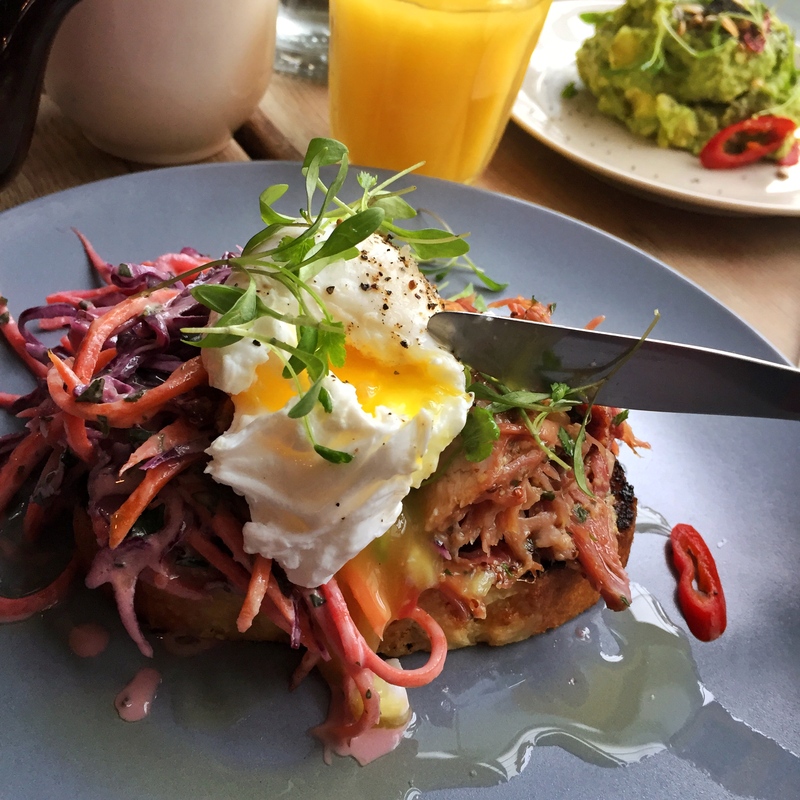 But Berlin is where brunch became a necessity. I was lodging in the most beautiful flat, with its eclectic antique furniture, incredibly high ceilings, curtains so thin they were practically transparent, and then my room, long forgotten: a small single bed in the middle of a bare room, its simple IKEA furniture never quite capable of filling it. But so much light: even in the dark depths of the bone-cold winter the room would be inundated with light, forcefully bypassing the see-through curtains and waking me up way before I should have woken up. And I remember waking up, lying in bed for hours, my mouth dry, the memory of icy cocktails and generous glasses of red, always half spilled, that had turned into a headache, and lazily getting into the shower, standing under the steamy hot water for too long. We always seemed to have brunch plans. We would plan to meet around one in the afternoon but actually meet at two and often we would not be served until three. I remember having to wait forty-five minutes for an omelette in a cutesy pink-walled candy striped little cafe in Prenzlauerberg. 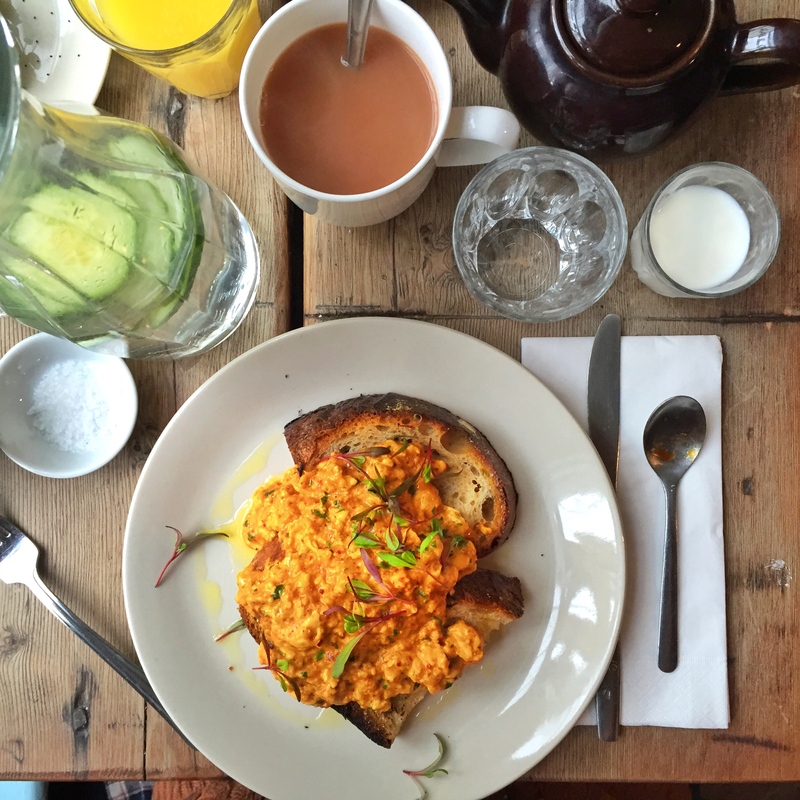 But it was fine, because by then brunch had become a finely tuned ritual and the food was a small part of it. First there was the hot drink -weak tea; black, bitter coffee- and then the cold drink -a juice; a creamy, frothy milkshake – and then maybe a second cup of coffee and perhaps a latte, and that’s before sweet, spongy pancakes and silky runny yolks would be presented on our table. 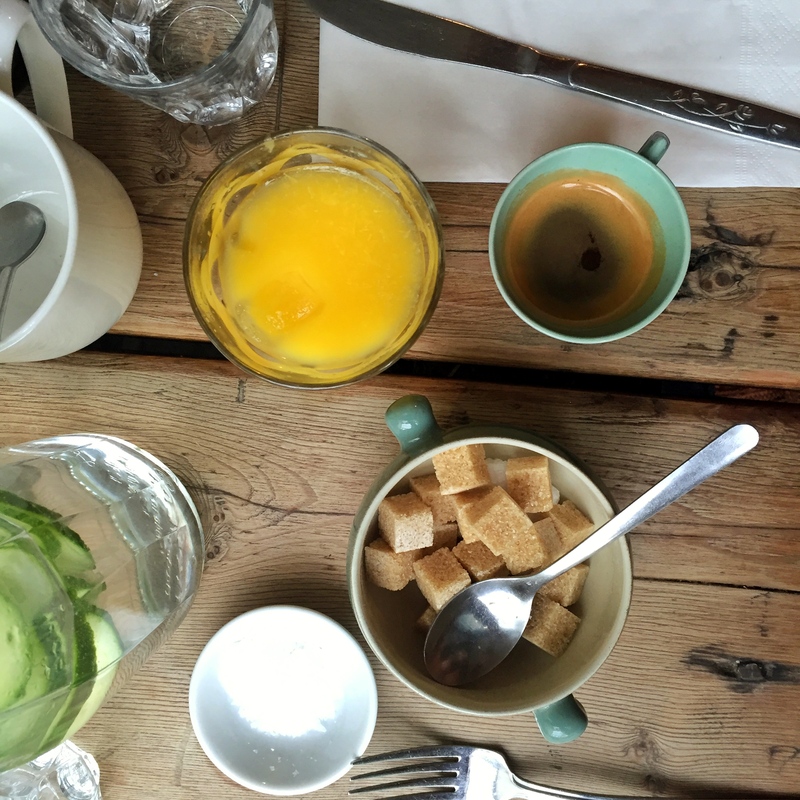 Brunch could take up a good part of a day, and as someone who loves rituals, I enjoyed every aspect of it. Whether it was American-inspired, a more German mixture of sturdy cheese and fat-speckled salami on dark rye bread, or an all-you-can-eat Russian brunch buffet with devilled eggs, jewel-hued caviar and a spanking fresh salmon with a piercing pink beetroot sauce, brunch was the perfect mixture of hot drinks, delicious food and tranquillity. 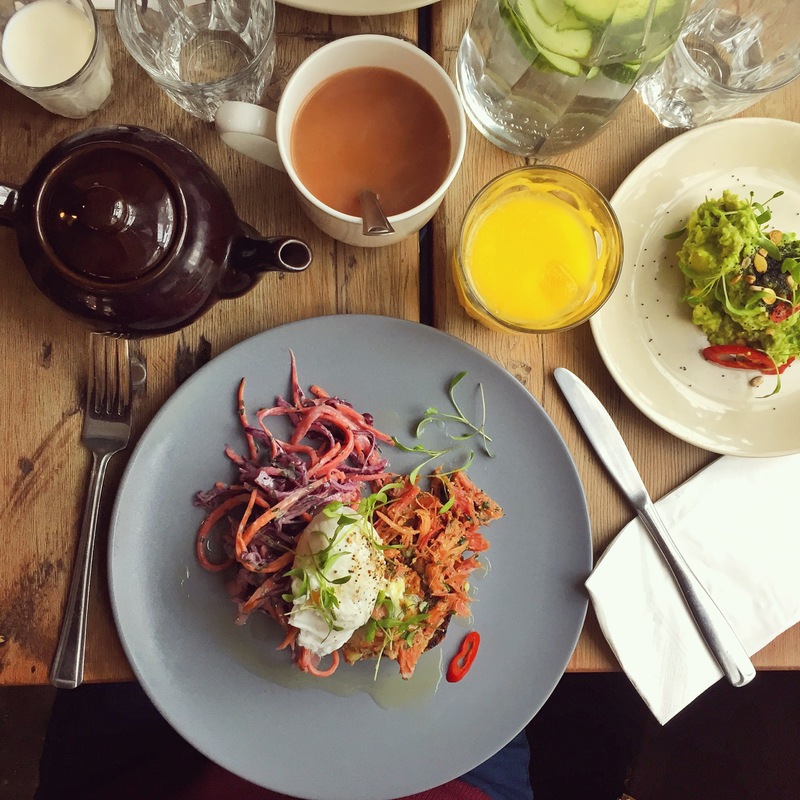 A lot of things have changed since then – I live in a different city, I have an actual full time job that makes spare time feel very precious and rare, and because keeping up with the London food scene feels like a lost cause, I often find myself eating in a rush. If you get there before 12 there will be a huge queue, they sell out of their best thing before three, etc etc. But not in Salon, Brixton. Salon lets you book a table, which may seems like a very simple thing you find yourself taking for granted, but it’s a rarity in London. It feels like a privilege to simply show up and have a table waiting for you. The place itself is adorable, with Scandinavian-looking minimalistic furniture, cosy wooden tables, and suffused, warm natural light. A creamy espresso comes in a powder blue china mug, a black teapot, ever so slightly chipped, materialised itself on the table. Then come the little speckled sugar cubes, white and brown, and a miniature glass of milk that I pour into my tea to create soft white patterns before I mix it with a spoon. Then there’s freshly squeezed orange juice and a generous jug of cucumber water. And that’s just the beginning. There is just something about a small, wonky table covered in little china mugs, bowls and jugs that have to be skilfully re-arranged when the food comes. And what food. I go for three cheese cornbread with shredded ham hock and a poached duck egg. It’s appealing and comforting, the subtle cheesy kick of beautifully soft corn bread, mouthfuls of salty ham hock, and the creamy yolk tinting everything orange. 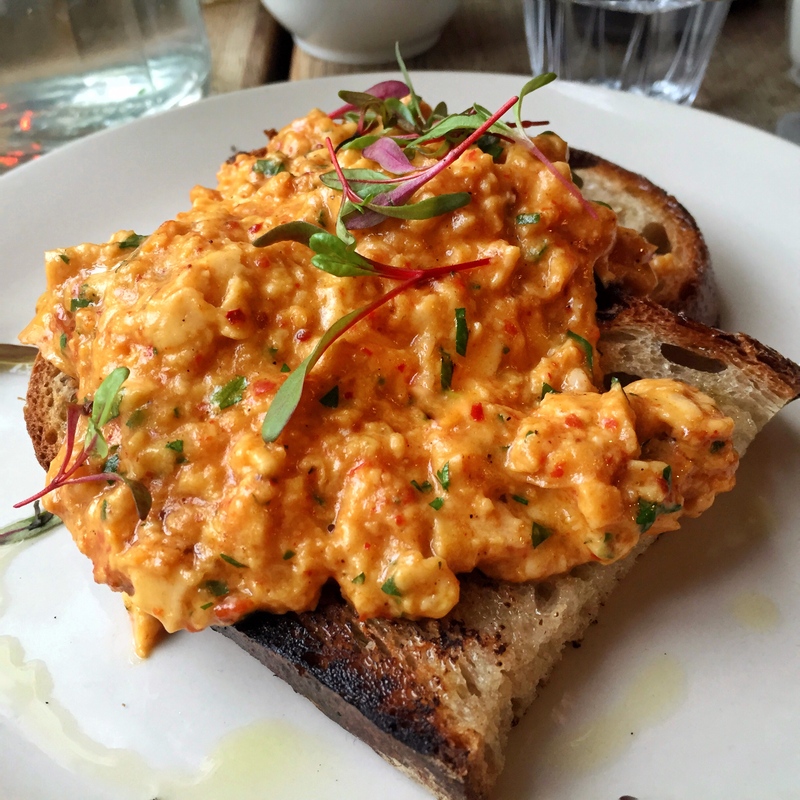 And the ‘nduja scrambled eggs, the silkiest, creamiest eggs imbued with bright, coral-hued ‘nduja, a soft spicy Calabrian salami, served on crusty sourdough bread with fragile, tender green leaves scattered on top. 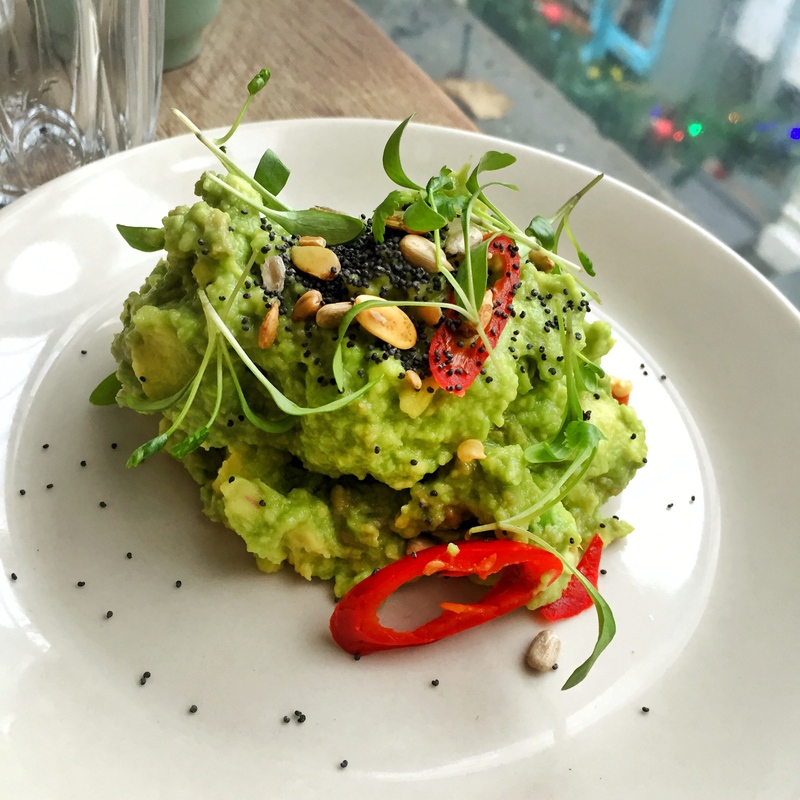 We shared a side of smashed avocado, so creamy and buttery that it barely needed any dressing up, covered in crunchy poppy seeds and thin slices of piercing bright red chillies. At Salon, time seems to go slowly, and you find yourself tempted to go for just another drink, to be drunk slowly from beautiful pastel mugs, taking in the light and, in the distance, the hustle and bustle of Brixton market.